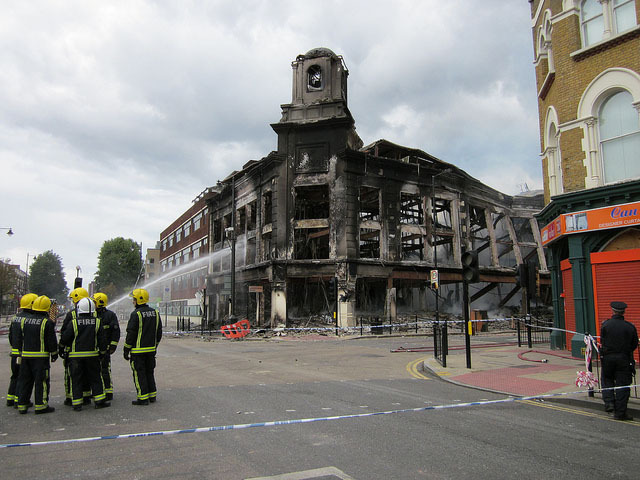 Firefighters - High Road Tottenham & Lansdowne Road, during the 2011 London riots. When people have grown up in a society where those institutions we should respect don’t actually command that respect then perhaps we should not be surprised. Concerned, frightened, yes. Surprised, no. The risk is there, but we have not assessed it. We have managed to create a significant underclass of people who are unemployed and unemployable, more or less dysfunctional and who effectively have no hope, nothing to lose and who create disproportionate drain on the police and social services by lack of judgment. How did it happen? To what extent did our broken educational system contribute? Those who were bewildered by these goings-on, and who had turned to religion as a source of spiritual and moral support, would be rewarded with the news that extensive child abuse had been going on for years and that the Pope, with his deeply questionable views on homosexuality, deals with the Aids crisis by telling people not to use condoms. When you have an institution that requires celibacy on the one hand and requires the participation of children in its ceremonies on the other hand, then there is a clear risk, but it wasn’t assessed. And when the risk became an actuality, it was concealed. Benny dicked us. Those who turned to the media for impartial facts found allegations that newspapers were carrying out illegal telephone tapping and that lackeys of a newspaper tycoon had been worming their way into the political system. Then we learned that radio and television broadcasting was a safe haven for paedophiles. We were told that DAB radio had “CD quality” which was a downright lie. Although the last financial crisis was a corker, it was just the latest of many. They happen with depressing regularity and they go to show only that, as a science, economics has about the same credibility as horoscopes or sacrificing goats. Fact is that economists haven’t a clue and have discredited themselves. They fail to predict crashes just as well as they fail to predict recoveries, inflation levels, unemployment and spare capacity. From a scientific standpoint, one can conclude two things. First, economists from Janet Yellen, Mario Draghi and Mark Carney down don’t have any model of the phenomenon they are dealing with, let alone an accurate one, and second, the phenomenon is divergent. You wouldn’t get on an aeroplane with those characteristics. I don’t need to dwell on the extent to which bankers have discredited themselves. Yet again we see the characteristic gross failure to assess risk, accompanied by recklessness fuelled by greed. When it’s not possible to fail because you get bailed out, you just take more risks and take the bonuses. The tell-tale inability to learn is there – the yearning for business as usual, which means in practice robotically clinging to the same questionable practices and making the same mistakes. But in one sense bankers have succeeded. Banks prosper by lending money. It follows immediately that the job of a bank is to cause debt, and in that they have succeeded beyond their wildest dreams. Their success is the success of the creeper that kills the tree, the success of the cancer that kills the host, the success of the virus that brings the internet down. The tree has no say in the growth of the creeper, whereas the growth of debt was by consent of countless individuals. We can look at broken economics another time. However, bankers operate (unless no one is looking) within regulations that are determined by politicians, who have no better knowledge of economics than economists and frequently worse. Some of the recklessness of the bankers is down to relaxation of regulations by politicians who never seem to be able to anticipate the broader effects of their decisions and who think the solution to every problem is a dollop of dogma. Leadership has been replaced by followship, where politicians mould themselves to what the public appears to want in order to get votes. So if the present crisis has done us any favours, the widespread and deserved disrespect now felt for politicians, bankers and other institutions is one of them. But the real favour is that the crisis was, or should have been, a wake up call; an unpleasant reminder that something is deeply wrong in the way we conduct our affairs, so deeply wrong that it is essential to understand the fundamental errors and make some changes. Doing nothing is not an option. We can look into understanding the errors in a future piece.